Redesigning Work: Does the Office Need a Redesign? We’ve recently moved offices and are getting settled into our new space. This, coupled with our research about the future of work generally, has got us thinking about how where we work impacts on how we work. Workplaces have been rapidly changing over the past decade. The office of old—with cubicles, walls and permanent desks— is being replaced by open, fluid and informal spaces. Workplaces also now extend beyond physical spaces, as technology allows staff to communicate and collaborate regardless of their location. Many offices are now open-plan, with communal areas and hot desks. 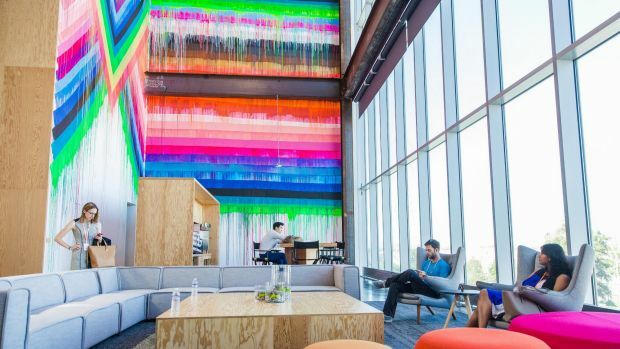 Facebook’s central building is the world’s largest open-plan office. The 430,000 square foot office houses more than 2,800 employees, and even CEO Mark Zukerberg sits out in the open. Companies all over the world are moving towards similar, albeit smaller, working spaces. These are designed to change the way we work; allowing staff to overhear conversations or bump into each other, leading to unexpected collaborations or new ideas. But, is the move towards open plan offices a good thing? The jury is out. Open plan offices are thought to be damaging for workers’ attention spans, productivity and satisfaction. Research has also shown open plan offices can lead to more sick leave and higher noise levels, which can impact on performance. In a 2013 study, nearly half of the surveyed workers in open offices said the lack of sound privacy was a significant problem for them and more than 30 per cent complained about the lack of visual privacy. Some are calling for an end to open plan offices, but we don’t think the answer is simply getting some gyprock and re-erecting walls. Instead, it’s about thinking of ways an office may be segmented into spaces for different tasks and personalities. Creating break out spaces, for example, for collaboration or meetings; or private rooms for when people need to have confidential discussions or just need some quiet time. Another trend is the growing popularity of coworking spaces; where individuals can rent a desk within a shared office. Coworking spaces are popular among freelancers, entrepreneurs and remote workers looking for a desk and access to facilities such as printers, scanners and meeting rooms. The number of coworking spaces around the world has increased from about 5,800 in 2014 to more than 13,800 in 2017. The rise of these spaces reflects a broader shift towards part-time ‘gigs’ for many workers (which sparks another whole debate; we’ll save it for another day). The Harvard Business Review surveyed hundreds of works from different coworking spaces around America. It found that people who use these spaces tend to find their work meaningful, have more job control and feel like part of a community. Unlike a traditional office, coworking spaces consist of members who work for a range of different companies, ventures and projects. As a result, there is little direct competition or internal politics, and workers don’t feel they have to put on a ‘work persona’ to fit in. Traditional offices can surely learn a bit from this model. As the future of work changes, it’s inevitable that where we work will change too. However, it’s vital that changes to work spaces are backed by evidence and suit the people working in them; rather than simply following a trend. We’ll be exploring this issue more in our upcoming report Redesigning Work, so watch this space (no pun intended). Get in touch if you want to find out more or would like to be notified when the report is published.